How Does It Lower Open Table Cover Fees? The single most valuable feature of Reservation Genie is that it never charges covers fees from regular customers. There are tools that help you build a successful concierge referral program" and cover fees are associated with concierge referrals. But the concierge tools are optional and most restaurants are comfortable paying referral fees for guests they wouldn’t otherwise get on their own. It’s paying cover fees for their regulars that ultimately frustrates restaurants. That’s where Reservation Genie takes aim at Open Table. Reservations booked by Patrons (any reservation that is not a concierge referral) never trigger cover fees and 100% of their reservations are included in the low price of $49 per month. It doesn’t matter if the customer books from your website, books through a third party website you connect to Reservation Genie, or comes back to book through the Reservation Genie website in the future. As more of your regulars get used to booking through Reservation Genie, they don’t trigger cover fees. In contrast to the Open Table model that focuses on driving customers towards restaurants willing to pay higher cover fees, Reservation Genie rewards customer loyalty by tracking visits and offering perks for frequent patronage. These perks are given directly to your customer, so there are no middle man fees or profits generated by Reservation Genie. Plus you are in full control of any perks and can get creative with perks that promote your brand. 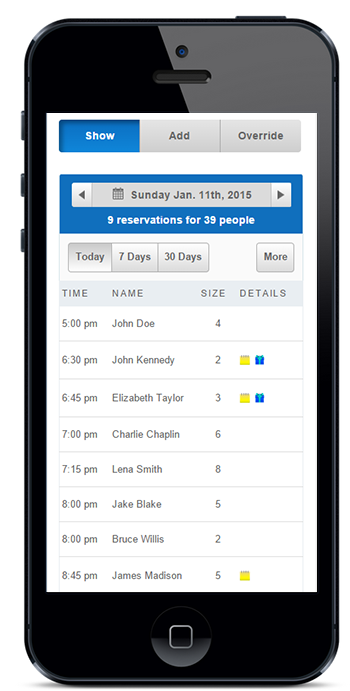 The latest iteration of Reservation Genie enables restaurants to run the entire system from their phone. The flow is different in desktop and mobile views, but both are easy to navigate and intuitive. If you’re reading this on a phone, you can get a feel for the simplicity by watching the Reservation Screen Tutorial here on Youtube where it will open full screen using the Youtube app. For desktop viewers, it’s embedded below. This latest rollout also added options to the SMS Notification system that gives restaurants the option to view reservations in text-based SMS notifications or receive a link to the details. You can open those details on your phone to see all the information necessary to manage the reservation, mark reservations No Show or Completed, and even block reservations if you suddenly get slammed. The recent changes and mobile optimizations are designed to be intuitive and flow naturally across all devices. You can use your phone to manage reservations or invest in a $99 Kindle Fire and mount it at the hostess stand for a more permanent long term solution. Any way you choose to manage things, it’s a great way to control costs and boost customer loyalty while supporting a system working hard to eliminate cover fees. Feel free to reach out with questions about the program or use this link to schedule a demo today.